Thank you for your review of the Grand Hotel Royal, sharing your wonderful experience while in our hotel. Exceeding your expectations to ensure you have a great experience during your stay is what we have always strive to achieve and I am really pleased to learn you had a good stay! It will also be a pleasure sharing your compliments to the team; a special thank you for the mention from Paolo and Mauro. We look forward to welcoming you back! The price you found is 20% lower than this hotel's average rate of $300/night. The price you found is 17% lower than this hotel's average rate of $582/night. The price you found is 22% lower than this hotel's average rate of $354/night. 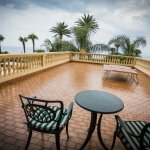 We have just returned from the Grand Royal Hotel in Sorrento, the Hotel is beautiful and the views from the sea view balconies is stunning. All areas are well kept and very grand, however for a quite expensive Hotel we felt the food let it down, we have stayed at a number of less expensive Italian Hotels and have always enjoyed the food, here it was mediocre and very repetitive, same menu every night. There were special nights with a themed menu and entertainment, felt like we were in a holiday camp, being serenaded or people trying to make you dance, some of us just want a quiet meal and don't want to be publicly humiliated. Our other gripe were the Towels, they are small and very scratchy. If you both have a shower then there are no spare towels to dry your hair a bit of a problem when you have a lot of hair. I have read lots of other reviews and it seems most people enjoy the hotel, I would recommend staying there but eating out each evening, breakfast was fine, and take some towels with you. However for the price they charge you shouldn't need to do this. Room tip: Rooms with a sea view are lovely but you do pay a premium. We are pleased to know that you have appreciated the hotel and the stunning view . On the other hand we are really sorry that your stay did not fully meet your expectations and your comments have really surprised us. In the bathrooms there are 3 towels for each customer: 1 bath towel, 1 towel for the face and one for the bidet; they are changed every day and upon customer's request as well. It is the first time someone says that towels are not soft; the management is available to guests at any time, why you did not say anything when you were in the hotel? The food, greatly appreciated by our customers, is all very fresh, varied, well cooked and normally suit all tastes but if it were not so, you just need to ask the head waiter to change the dish in order to satisfy your personal taste. Every day in our restaurant there is a choice between 20 starters and 20 main courses plus the "specials of the day" recommended by the chef. Special evenings with music are a pleasure for our customers and certainly no one is forced to dance; if one does not want to dance simply politely refuse. Thank you for having chosen our hotel for your stay, and look forward to having you back. We started the first part of our honeymoon here before continuing on to other locations. We decided to take our toddler away with us which turned out to be a good decision for the best part of the holiday, however I did find it a bit of a struggle in this hotel. Staff were pretty accommodating when I asked for cows milk etc and always friendly towards our little boy. However, a lot of the guests seemed particularly perturbed by the idea of us holidaying with a child in this hotel and didn't particularly enjoy him splashing and playing in the pool, despite no one else having any interest in swimming. It was a beautiful hotel and the lunch time food we had on the balcony near the pool was lovely. We didn't eat our evening meals here and instead went into the town in order to escape some of the stuffy guests. The pool area was nice but a lot of the sun loungers were in the shade and it seemed lots of people got up early to do the particularly desperate act of saving themselves a lounger in the sun by putting a towel on it. The pontoon area, however, was a great place to go and get some sun and have a lovely dip in the sea. Not very baby friendly with our little one but we expected that would be the case. Certainly would have spent more time there had we been alone as it was really beautiful. We particularly enjoyed having a drink back at the hotel in the end of the evening on the balcony overlooking the sea. Beautiful views at night. Very very good location as only a few minutes walk and you are right in the centre. Clean, modern rooms with a lovely little cot provided for our little boy. Thank you so much for your stupendous review and for choosing us for your honeymoon; we are so pleased that you chose our hotel for this special occasion and that you found our team and service exceeding your expectations. and look forward to your return to the “Royal”. Having read a number of the reviews on Trip Advisor (which was our reason for booking this hotel) we weren't surprised when all the reception staff did their very best to provide great service and remembered who we were and our room number. We were on a short break to celebrate my 40th birthday and on arrival we'd been upgraded to Room 100. On arrival in our room we discovered not only champagne but what we suspect is one of the best rooms in the hotel, with a balcony of such a size that other guests confessed their, as they described it, BALCONY ENVY. The balcony is huge and the room highly recommended. While the hotel is clearly quite old, the management have done a great job of keeping a more modern feel. While we stayed there the hotel hosted a fairly large wedding which not only didn't impact our evening meal (Chateaubriand which we can thoroughly recommend) but we also didn't hear any of the partying, despite the wedding being virtually below us (being on the first floor). It was well located for the main square, only about 6-7 minutes walk away which allowed it to be peaceful. We had spa treatments which were carried out at their sister hotel, a short walk away, and these were very pleasant. We're unlikely to return to Sorrento, it was nice for a short break but that was enough for us, but if we did we'd be likely to return there. Anyway, check out our photos from the hotel in our gallery which show the breathtaking views from the hotel's balcony! Ps. their wifi is the best we're used in any hotel. Thank you for review, I am very pleased to read that you enjoyed your stay with us. Thank you for recognizing the outstanding service you received, it is brilliant to know that you found my team to be friendly and helpful. It is always our intention to create lasting and memorable experiences for our residents, and I am delighted that we could do so for you. We are happy to read that you appreciate the room, the wi-fi, the great food, the location and the spa treatments carried out at our sister hotel Ambasciatori. To hear such wonderful feedback really does mean a lot to the team and I. We will hopefully see you in the near future for another pleasant and relaxing holiday! Where do I start..... This hotel may be a little more expensive than others around but to be honest you do get what you pay for. We deliberated over many of the hotels in Sorrento and we couldn't have chosen better. When we arrived our room was in darkness and we quickly realised that each room had shutters which kept the room cool during the hot days and also kept out any light at night which meant we had fantastic nights sleep each night. 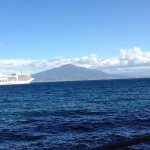 Our room faced Mount Vesuvius and the Bay of Naples which is one of the most stunning views I have ever had. We could also see the harbour which was fascinating watching all the boats, ferries and private yachts coming and going along with the cruise ships moored just out to sea. The hotel is traditional, not 'old' looking, the decor is tasteful and fresh and incredibly clean. All the staff, including the housekeepers, were very pleasant and friendly and made you feel welcome. The reception team in particular were there to help with any request and helped us plan our trips around the area. Salvatore was a delight to deal with and is certainly a credit to the hotel. As you can tell we have had a fabulous holiday, one of the best we have had, due to the stunning part of Italy we were in but also to the hotel where it was a joy to return to each evening after a busy day. Many thanks for taking the time to write your review following your stay with us at the “Royal”. I am so glad to read that you enjoyed your stay with us and the service you received from my great team I am so proud to have at the hotel. All the staff especially Salvatore at the reception department are grateful for your really kind words; nothing can be more pleasant for us to know that you appreciate our job and of course the beauty of the Grand Hotel Royal. 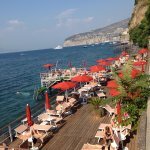 Sorrento is one of the most famous holiday destination in Italy and the “Royal” is one of the most renowned hotel in the centre of the city. The comfortable rooms, the private beach, the pool, the centuries-old garden, the terrace with its amazing view, the great food, the wonderful restaurants, the staff professional and friendly,…. ; all these aspects render our hotel unique and exclusive. Anyway, we know we are not perfect and we are continually striving to improve the hospitality we offer. 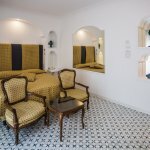 Thank you for writing: “We deliberated over many of the hotels in Sorrento and we couldn't have chosen better”. 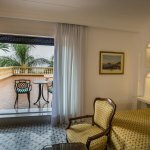 I am also delighted to read that you appreciated the electronically operated shutter in the room and the relaxing atmosphere of the whole hotel. Assuring you since now our best attention to your next further visit for another great stay, may we take this opportunity to send our warmest regards. Thank you for the great review of your stay with us at our “corner of paradise”. We are pleased to know that you have appreciated the location, the stunning view and the great food. The team here at the Grand Hotel Royal are all working towards making the hotel a great place to relax & stay & I am glad that this came across during your visit.